A Painting Short Break in beautiful Devon, learning to paint gardens and landscapes in their full summer colour. This is a studio and garden based course which introduces and practices skills which will help you to create successful sketches and paintings. 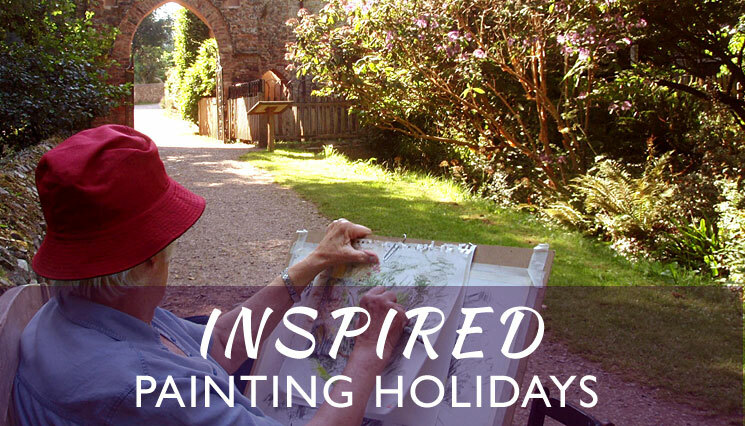 The timetable runs from Monday afternoon to Friday morning, and we aim for a full day out or two half days in one of the beautiful gardens of the area, using it as inspiration for sketching and painting. There is time to learn skills for working outdoors and composing a picture with a gradual introduction to working from outdoor subjects. We will cover sketching, tonal values and composition, negative painting and colour mixing. Students receive individual advice on use of materials and painting skills in their chosen medium. Materials Please bring sketching materials including charcoal, sketchbook, and painting materials in any non solvent based medium. More detailed information about materials and equipment is sent out shortly before the course. You may already have all you need to get the most out of your holiday - we encourage you to contact the artist for more advice, so that you don't leave behind things that you will find useful, and to avoid expensive purchases which may prove unnecessary. Also recommended- protective clothing for painting, suitable footwear and clothes for outside work, including waterproofs. Digital camera. Folding stool if needed. Bampton is 12 miles from M5 junction 27 and from main line train services at Tiverton Parkway, with direct trains to many locations. (e.g. London Paddington- 2hours, Birmingham New Street 2.25 hours) We can arrange to collect students travelling by train or coach from Tiverton Parkway Rail Station or Tiverton Coach Station.